Introducing Tinker Tone Records! Owensboro’s first and only indie record label specializing EXCLUSIVELY in 7-inch vinyl records! Tinker Tone Records is not your average record label. Most labels focus on signing artists. They develop the artists, pay for studio time, book gigs, promote the music and basically have their hands full. It’s an incredible financial investment. And in order to protect the investment, labels must keep their artists under exclusive binding contracts for years at a time. Tinker Tone doesn’t work this way. If they hear something they like, they ask permission to release it on 7-inch vinyl. Tinker-Tone owns nothing and the artists are free as proverbial birds. They walk away with a stack of free copies of their music on a tangible format, to do with whatever they please. Sell them. Give them away. Keep them, enjoy them. Whatever. The records are pressed in limited numbers, always 300 copies or less. This makes every release an event, something special. So why specialize exclusively in singles? Good question. Tinker-Tone believes there is something uniquely special about the 7-inch vinyl single. Two songs. Two sides. A romantic concept. Tinker Tone Records view the format as nothing less than musical perfection. Nice. Clean. Simple. ROBOT GIRL is a fun and “camp-ish” piece, but also well delivered, it has a sticky polka style to it which makes the inner critic wince a bit but the overall fun lover giggle, this is definitely a single to own for it’s wit and humor, the “B’ Side “Don’t Mess Me Around” is for the traditional garage punk lover, very raw in sound but well played, drums are right in the sweet spot but holding tight to the equal blending of guitar, vocals are “close to the microphone” with short bursts and pumped anger to the tone and speed of lyrical assault. again, one to own, and as a 1st of the press single from a new label with an optimistic approach to music distribution, they will have a devout cult following, much like their contemporary labels Hidden Volume Records, Fat Elvis Records, Classic Waxxx Records and Philthy Phonographic Records. Mark Ten (a.k.a. Mark Tennant) has been busy in various local music scenes since the early 1980s, though he has never had an official release under his name. Known for his quirky songwriting stylings and his intense on-stage persona, Tennant finally returns to the fold with this debut 7-inch record, exclusively from Tinker Tone Records. Tinker Tone has unearthed two remarkable Mark Ten tracks for guitar-thrashing, accordion-slinging posterity. At times recalling lo-fi greats of a bygone era, these tracks are pure gems for fans of such unpolished productions. Of particular note is the B-side “Don’t Mess Me Around.” Originally recorded live to cassette tape in 1985, this track has lost no energy in the 31 years since Mark took the stage with his band The Blitz for a show in the Texas heat. No overdubs, no studio reworkings, just raw primal energy. The original tape has been dusted off and is presented here for the first time in all its original lo-fi glory. This is what it’s all about. The A-side, “Robot Girl,” offers distinctive vaudeville-esque sounds and intriguing vocal delivery, all while displaying the unique Mark Ten persona. An unconventional love story told under the red lights of Amsterdam. Together, the tracks represent two very different phases in Tennant’s career. 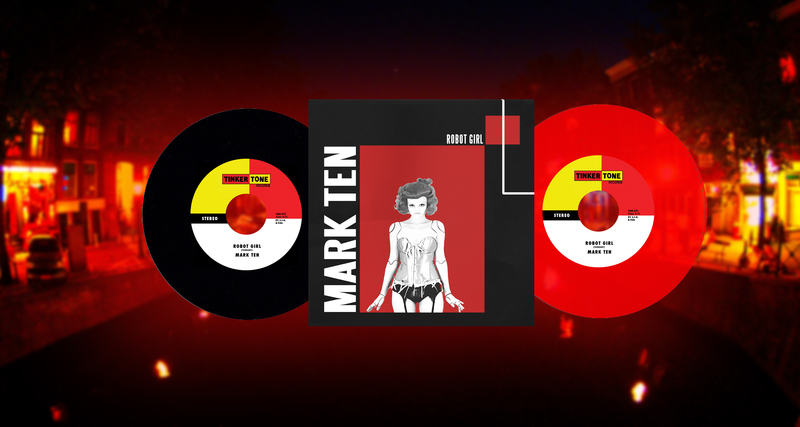 And we are proud to present this debut release, an extraordinary introduction into the world of Mark Ten and his band.